Egg is what I have for breakfast on most weekday mornings, sometimes on weekends too. A good protein, it fills you well in the morning and gives you energy to tackle a work-heavy morning. Having it as egg paratha gives an interesting tasty twist to eggs. 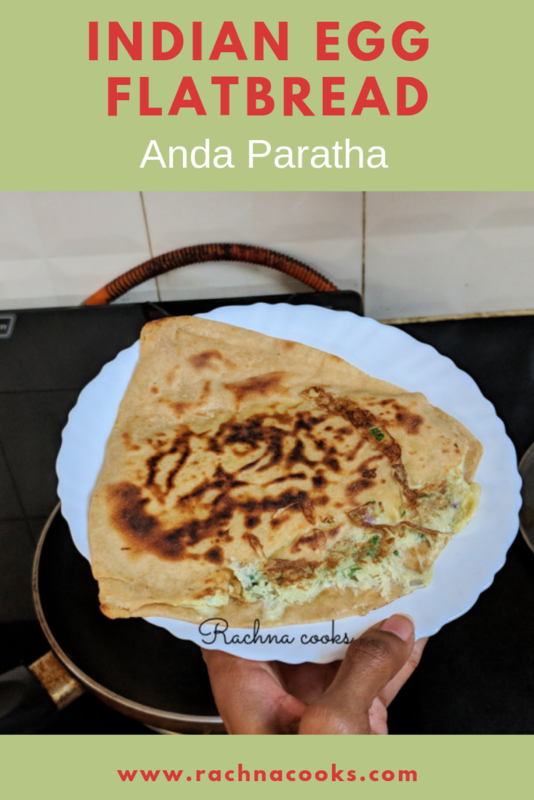 My younger son loves it and often asks me to make anda paratha. The egg cooked inside the paratha is super soft and delicious. If you haven’t tried this recipe, you must. You may have seen streetside carts make this. 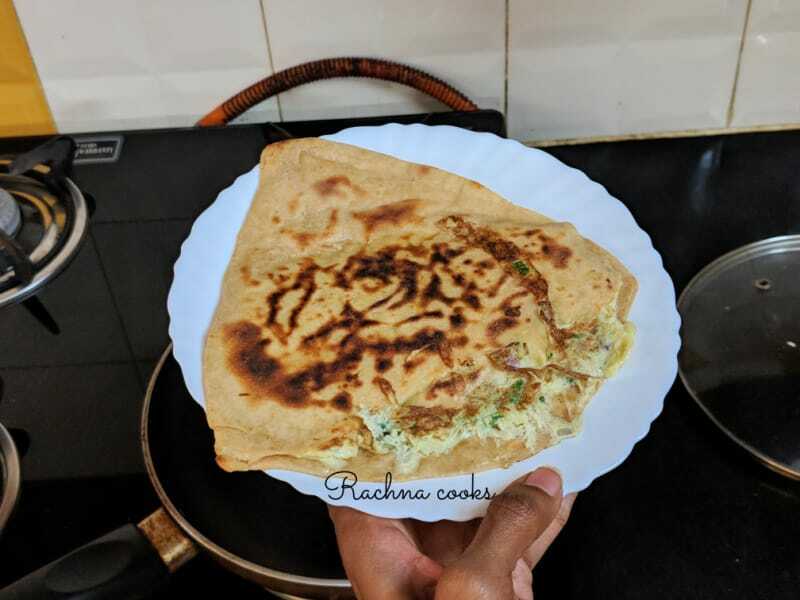 This is an easy recipe of the street style egg paratha or anda paratha recipe. Flaky flatbread that has delicious masala egg filling is a perfect breakfast or anytime snack. Make wheat flour dough by adding water to whole wheat flour and forming a stiff dough. Keep it aside for 15 minutes. Break two eggs in a bowl. Add all the chopped ingredients and lightly whip them together. Roll out a paratha. I normally make a triangular paratha. I am sharing a video of how to roll out a triangular paratha after the recipe. Heat a tawa and put a paratha on it. Lightly cook on both sides applying oil. Now open out one of the layers of the paratha carefully with a knife making sure not to scald your hand. Pour in one egg with mix inside this fold. Cover and cook for some time on low heat. Now flip and cook on the other side. It is okay if some egg mix escapes out. Spread more oil if needed. Cook on low flame for 2-3 minutes till the paratha is done and the egg inside is cooked. Your anda paratha is ready to serve. Enjoy with pickle or just as is. 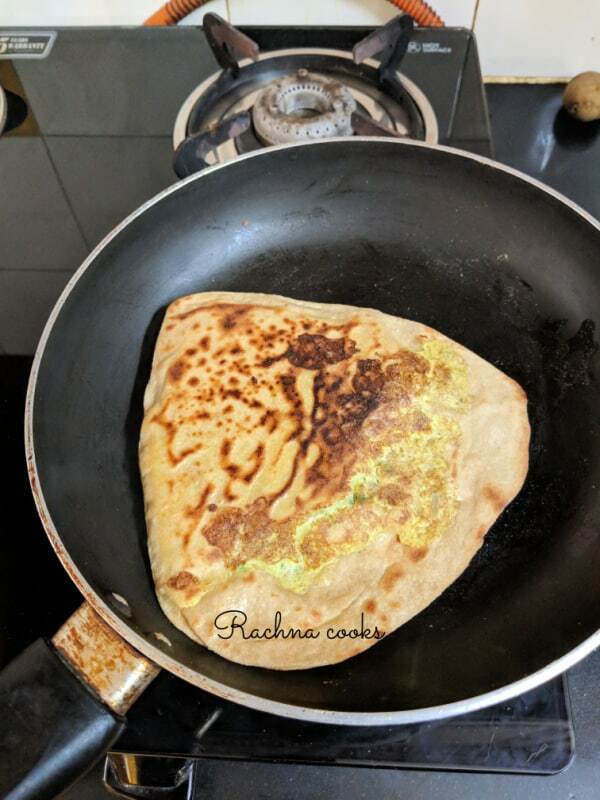 Always cook paratha on low flame else your paratha will cook before your egg mixture inside. Once the paratha is done it looks fluffier. The egg inside is softly done and stays moist and juicy. Your egg paratha is ready to serve. I like Egg only as an Omlette, but this Egg Paratha looks delicious! Going to follow your recipe and make myself this one for breakfast soon! Looks so good. This could be an easy breakfast I can make. Would be great with some chutney as well. The moment I read the recipe title, my mouth started watering! Thanks for sharing this. 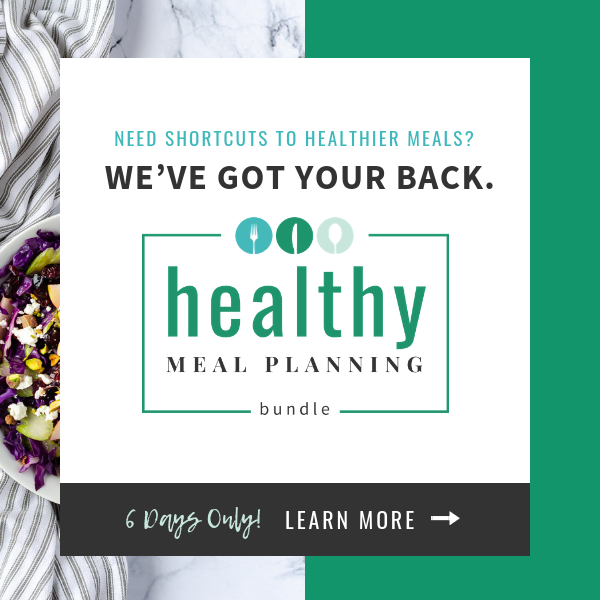 You have given a great idea for an awesome, easy and quick breakfast!! This looks good. I see you’ve added chopped onions etc also to the egg. 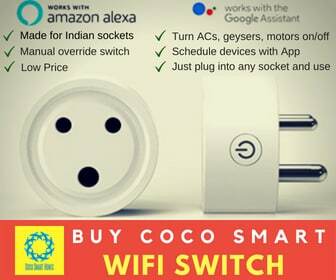 Must try this sometime. Do you have a recipe for making egg rolls with leftover parathas/fulkas? If yes, then plz tag me with the link. On twitter or FB. OR DM if you prefer. Thanks Geetika. I hope your husband enjoys it! 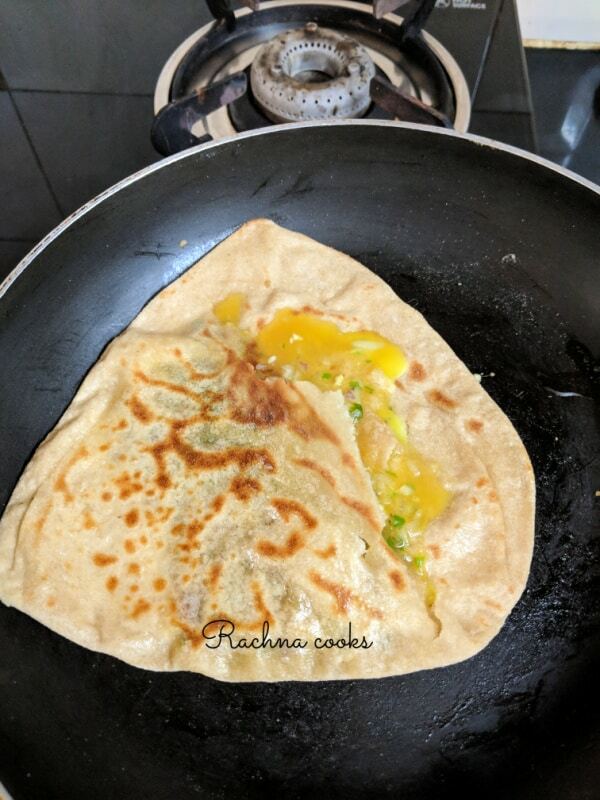 We love egg parathas though I dont make them very often. Must make it one of these days. Thanks for the inspiration, Rachna. Looks so delicious and is healthy! Will try it some time.